The modern, mobile enterprise is expanding faster than ever, across every part of the world and in every industry. Increasingly, organizations are looking for comprehensive security blueprints to help them secure their mobile devices, apps, and data without compromising productivity or the user experience. For that reason, iOS has become the mobile OS of choice in a majority of enterprises because of its highly intuitive, user-friendly, and easy to manage design. 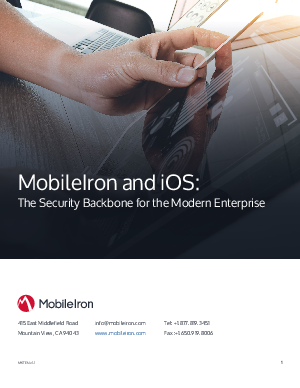 With MobileIron’s enterprise mobility management (EMM) platform, IT organizations gain a comprehensive mobile solution that complements and augments the security features inherent in iOS.